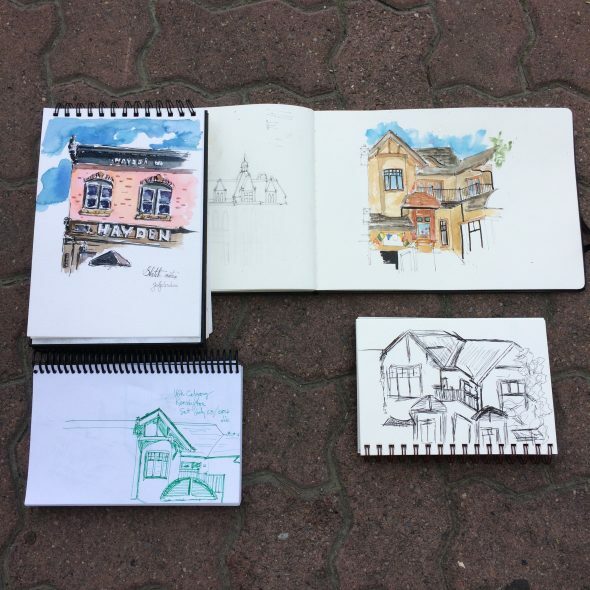 Back in July I joined up with a few other people for our first Calgary Urban Sketchers meetup! It was fantastic. I stumbled onto the community about a year ago and wondered how I could have possibly missed out on it all this time. Calgary didn’t have a group set up at that time, and I debated on getting something started by myself, but the decision was taken off my hands when another wonderful individual decided to go ahead and get the ball rolling. His name is Ernest and you can see his work here. There were four of us for this first meet up and it was fantastic! I was in the company of total strangers and we had so much to talk about! We met for coffee at Higher Ground in Kensington, then found a set of benches to sit together and sketch on. We were together for about two hours. We talked about our processes, and I got to learn more about fountain pens – something I’ve been debating on purchasing for myself but hadn’t done any research on yet. What was great about the Urban Sketch meet up was the support and the company. It helped me stick to what I was drawing. For someone newer just starting out who might be a little less confident, it was great to have other people there that you could discuss approach with. We all had different takes on how to work on our drawings too. We wandered Kensington together for a bit afterward, and then I settled onto the benches looking out over the 10th Street bridge into downtown. 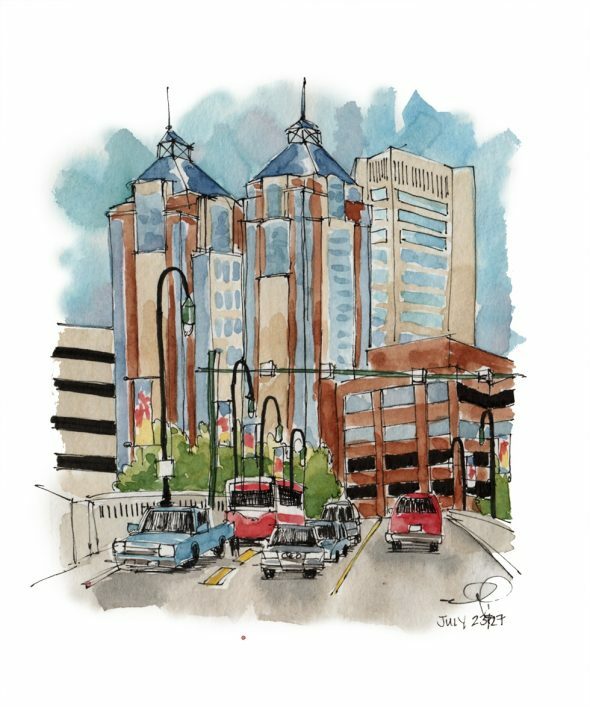 I’d just finished reading Gabi Campanario’s Urban Sketcher’s Guide to Architecture and Cities, and wanted to try framing in a scene while sitting on site. Not too shabby I thought! Less heavy on paint than normal but for an early sketch I was pretty pleased with it. I do want to get more practice with overall cityscapes and I’m finding it’s that balance of too much to too little detail on all the buildings that I need to play with. This entry was posted on Sunday, August 14th, 2016 at 6:00 am. 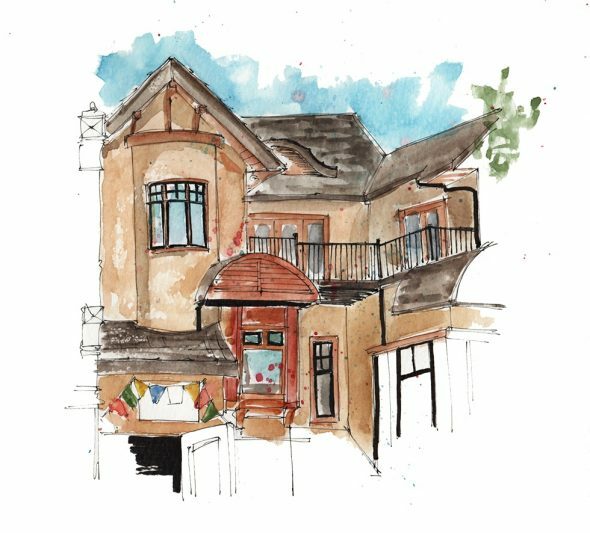 It is filed under General Musings, Sketching YYC and tagged with Downtown Calgary, Urban Sketchers, urban sketchers calgary, urban sketching, weekend, yyc, yyc blogs. You can follow any responses to this entry through the RSS 2.0 feed. Hi there. Any plans to meet up again?